What did I draw? In my every drawing I try to include two cosmic bodies: a moon and a sun or two suns. Two suns have a special importance for me. I like to call them my secret symbol. I believe that they are auspicious and drawing them will be like drawing something extremely good. Also you might notice several lone eyes here and there. This isn't meant to scare you. The eyes simply symbolize that there is a higher power watching the material universe. This might also represent our inner knowing that someone's watching us and the life. All is interrelated and watched either by our inner selves or by some heavenly viewer. I do not know why I drew the tree on the house and the other two trees on the different sides of the first tree. Then there are two deities doing energy healing on the different sides of the house. One deity is placed above, in the sky, holding her hands as if in namaste. It may indicate a prayer, a blessing and protection. The three deities form a triangle. The tree might represent a nature, life, the life on earth. The house might be myself and my family that is evolving and developing, growing up. Big mangoes on the tree, as all ripe fruits, represent good things such as money and health. 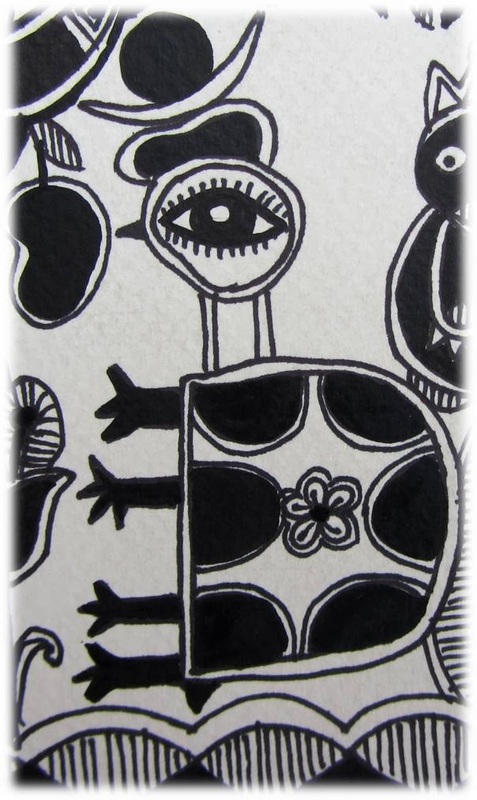 The animals rabbit, snake, turtle and a squirrel represent wisdom in different areas. 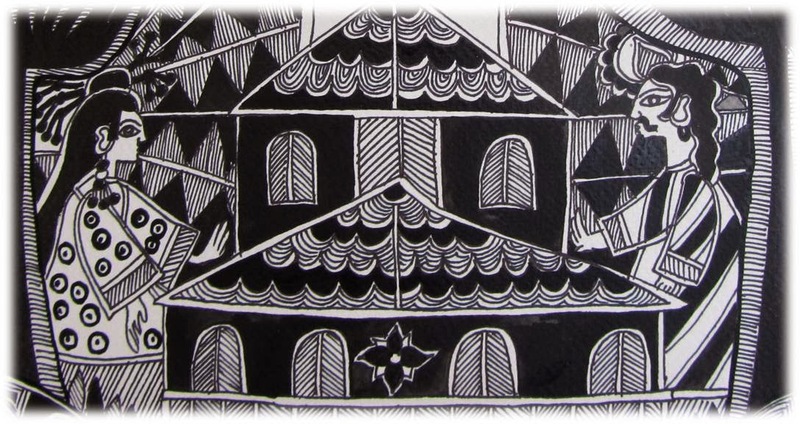 The hen on the top of the tree is a common roof ornament in West Lithuania's sea villages. They are made of iron and turn with the wind to show its directions. The two deities are Chinese and one is Indian. The deity above looks like Chinese empress and the deity on the left looks like a wise man from her court and the one on the right - an Indian wise man that looks a bit like the famous Bengali writer Tagore. On the right I have two famous deities. One is the teacher of one of the largest religions in the world and the other one is a Hindu avatar. Both stand on the planet Earth in the space. The Hindu avatar has a gift of a huge beautiful diamond and the teacher is pointing at something. There is the third deity too. Can you see the two black lines? This is its border. The background of flowers and small things spinning, moving and turning like atoms is its body. This deity is vaster than the Earth and it has a body of a huge bubble full of colorful particles. It doesn't look like human but it's conscious. Further away, on the other side of the rhombus border we can see the ocean with a boat and loads of sea creatures. It symbolizes the many dimensions climbed up on top of each other. It might sound sci fi but my imagination brought me that far in the space. The title of this post is called "How to Meditate When Drawing". I will be writing about this because it is an important part of any creating may it be drawing, writing, designing or composing. You might have heard that many artists, scientists and musicians get themselves in a state of light trance when creating. The genial ideas tend to come through this state. What is this trance state? It can also be called focus, relaxation, visualization, or meditation. Drawing something is replicating the vision and feeling that first appear in one's mind. The intention to hold that vision and feeling for as long as the painting is done and as clearly as long as it's done, is meditative focus state or meditation*. I think that everyone who does something and enjoys it already is in the meditative creative state. It may be cooking, exercising, walking, communicating, dancing or singing. The emotion of enjoyment is different from fun and laughter, for example. It is something slightly heavenlier and that's why I thought it would be great to write about it. Right side of the painting featuring...Guess who? How does one meditate when drawing and what does it feel like? 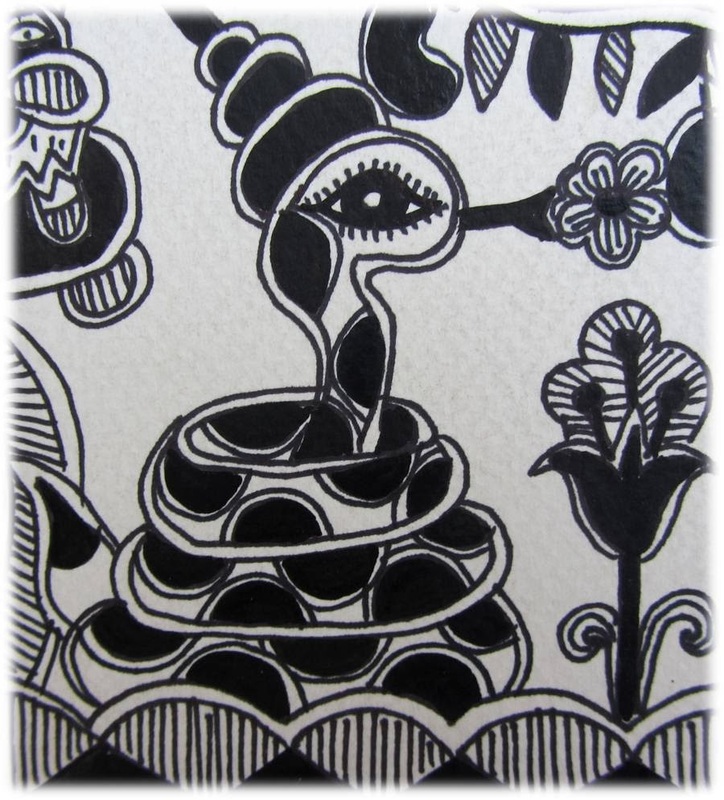 You'll need: a piece of paper and a fine permanent marker for Madhubani drawing. 5) I usually start seeing a picture already made on the piece of paper with the accompanying feeling; If I don't see the full picture, I see the borders or I know that the picture will be divided into two scenes and it will be black and white. You might know the theme at least. For example, you'll feel like drawing lord Krishna or you will feel like drawing lord Ganesh. 6) When the image/idea/feeling will seem to be the right one, you will be inspired to bring it to life. You will want to copy paste it onto the piece of paper from your mind. 7) Start drawing and try to focus as much as possible on that image/idea/feeling in your mind. Zoom it in and make it so clear that you will be able to feel the smell of trees and flowers you are drawing; the sound of the swing that Radha and Krishna are swinging on and the sound of the fish jumping in the water. Maybe you can imagine the taste of heavy mangoes hanging on the mango trees. It might be that you will be able to smell gobar, if you are drawing a village scene with cows and listen to the talks of the village women grinding spices in their mortars. 8) That is it. In the end you will have the copy of your mind and heart on that piece of paper. It might not come out as well and real as you imagined because the image would be changing every few minutes and you might want to end up with the different thing. However the feeling will be in that picture. You would have been successful in expressing your dream by putting it on a piece of paper. *Note: this post is a creative writing about a creative drawing. I am not the expert in meditation and psychology so the terms that I use, such as meditation, relaxation can be subjective as everyone defines these things differently. Anand, Mulk Raj, Madhubani Painting (New Delhi: Publications Division, Ministry of Information and Broadcasting, Government of India, 1984). Archer, Mildred, Indian Popular Painting in the India Office Library (London: Her Majesty's Stationery Office, 1977). Archer, William G., Songs for the Bride: Wedding Rites of Rural India, ed. by Barbara Stoler Miller and Mildred Archer (New York: Columbia University Press, 1985). Brown, Carolyn Henning, "Contested Meanings: Tantra and the Poetics of Mithila Art," American Ethnologist 23, 4 (November 1996), 717-37. 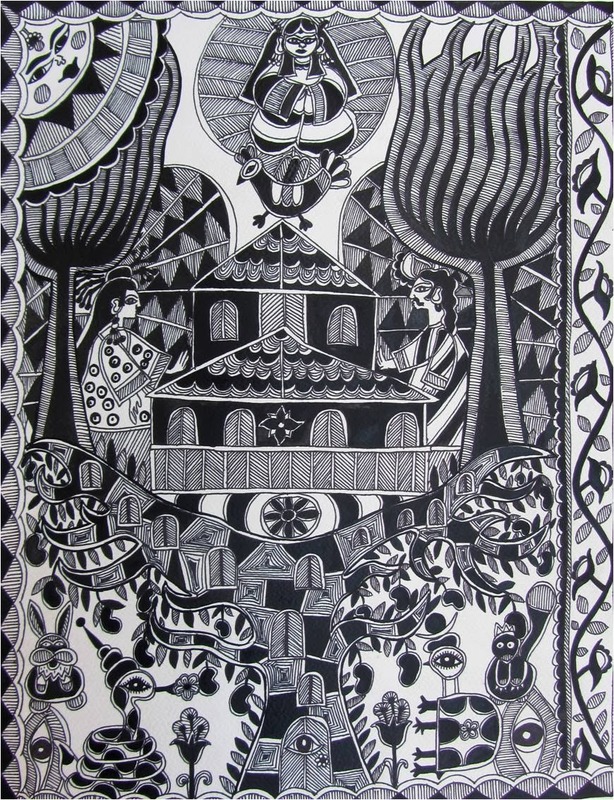 Brown, Carolyn Henning, "The Women Painters of Mithila," in Festival of India in the United States 1985-1986 (New York: Harry N. Abrams, Inc., 1985), 155-61. Craven, Roy C., A Concise History of Indian Art (London: Thames and Hudson; New York: Praeger, 1976). Craven, Roy C., Indian Art: A Concise History, revised edition (London: Thames and Hudson, 1997). Jayakar, Pupul, The Earth Mother: Legends, Ritual Arts, and Goddesses of India (San Francisco: Harper & Row, Publishers, 1990). Jain, Jyotindra, Ganga Devi: Tradition and Expression in Mithila Painting (Ahmedabad, India: Mapin Publishing Pvt Ltd., in association with The Mithila Museum, Niigata, Japan, 1997). 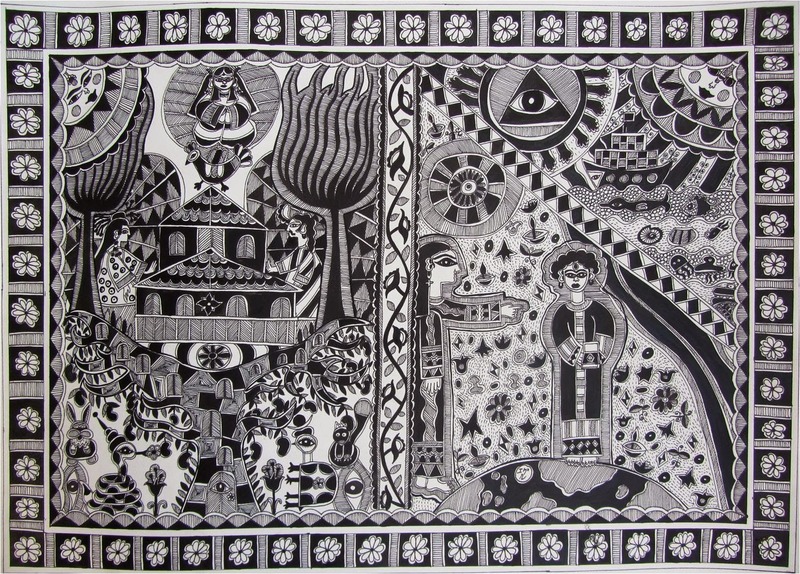 Mode, Heinz and Subodh Chandra, Indian Folk Art (New York: Alpine Fine Arts Collection, Ltd., 1985). Thakur, Upendra, Madhubani Painting (New Delhi: Abhinav Publications, n.d.). 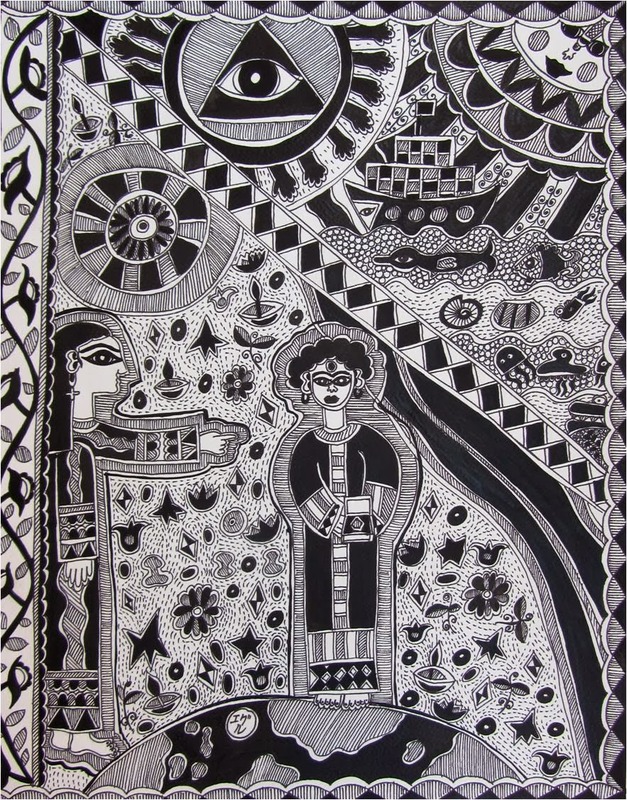 Vequaud, Yves, The Women Painters of Mithila (London: Thames and Hudson, 1977).